You do realize (or maybe you don't) that this has absolutely nothing to do with the trainer, go find the correct place and someone will or may help you there. Problem: Spawned cars vanish shortly after spawning them. With the new Scripthook, I tried loading the newest GTA V update today, cause I wanted to try out the new Oppressor MKII during storymode. The vehicle is easy to find in the Trainer's added cars section, but trying to spawn it or any other new car results in the vehicle vanishing shortly after it has been spawned. When the option to warp into car is disabled, sometimes I don't even have time to get into the vehicle, sometimes I can drive/fly around for a few seconds, but finally the vehicle vanishes. A Specter Custom I had saved in a garage is still there upon opening the garage, but trying to get into the car makes it vanish. Even most customized GTA-Online exclusive vehicles, I already had added in the saved cars section like the original Oppressor, Faction Custom Donk, Hijack Ruston, Infernus Classic, Issi Classic or the Coil Raiden vanish shortly after they have been spawned. Although the GTA-Online exclusive Cognoscenti 55 Armored, Vulcar Warrener, and the Sultan RS from the same save list don't vanish. Also there's the videos from gta-series-videos where Franklin is riding the new cars to show them off, some of the videos make obviously use of this trainer so this is confusing me. As far as I can say this only happens to GTA-Online exclusive vehicles, but not all of them. To me it seems like Rockstar's latest update tries to apply a mechanism to prevent these vehicles from spawning in storymode. Neither scripthook.log nor asiloader.log report anything. I'm using Trainer version 7.5 (Timestamp: 28:03.2018) and Scripthook 1.0.1493.0 (Timestamp 27.07.2018 10:32), no other mods are applied. Can anyone make a version that people can use this menu with a tkl keyboard? because that's all i have at the moment and because i threw out my 5 dollar membrane keyboard that had a numpad and i tried to change the keys but it still didn't work. Doppelblind, that's because the trainer wasn't updated for the new patch, it has now, so this problem does not exist anymore, no need for the mp-vehicles-in-sp mod anymore. This is the same almost every patch, if the global does change, which it did this patch. -compatiblity with latest patch (snow and recording UI will work). -added 14 vehicles, 11 have crew emblems. -added 49 peds (After hours peds on menu). -added 18 voices and all relevant speeches. -added 1307 objects (Object List 3, Objects 55). -added new teleport menu in other teleports, with fully customizeable interiors for the After Hours update. -N for next track does not work anymore, as Rockstar deleted the native. Awesome release man! Also, just so you know, you didn't set 7.6 as the "current" build on 5-mods. I did, but apparently it got reset again, I did it once more, and now it seems to be ok.
Hey, would it be possible to load the construction / dirty variant of the nightclubs with this trainer? I've been trying to locate the IPL to spawn it myself, but I've had no luck. Codewalker hasn't been any help in locating a ymap for placements at all, so I digress. A photo of the construction variant can sort of be seen below, but this variant is used before the club is properly set up in GTA Online. hmm there are only three IPL's that I am using, however I noticed there are some more in another rpf file It could also just be a single interior prop. INT01_BA_clutter might be the one, no idea. @theNGclan First interior style seems to have a dirt on the floor, try it. select style 1, the first clubname, no dj, no lightright, all other options disabled. I guess you also need to apply a certain timecycle, and it looks pretty much like the intial one in the cutscene. Let me know which one is getting rid of the dj stage, and I will create it an option in trainer. 'Enable MP Maps' worked fine, so thanks to Loku22. Now with the new update it's even better, not having to use additional mods, so thanks again to sjaak327. Sjaak could you kindly reconsider renaming the underwater pickup teleports with the list I posted on page 116? Yes, thank you for your work, I have just changed them. I was too focussed on getting an update out of the door, that I forgot about your contribution. As Always after a big patch, I plan on releasing at least one more update, so this will be in for the next update. What about number 61, it is not on the list, is this an oversight, or is this like 130-135 and there's nothing ? Oops, my mistake forgetting no 61. It's a health pickup, that don't vanish if you've picked up some other before. Additional I found out that the game's 'natural' respawn cycle is rather long. If you do nothing, it takes up to an ingame week to respawn the pickups marked with a *. When you're playing storymissions it takes a minimum of three missions to respawn the pickups, sometimes up to 5 missions are needed, and it's not bound to any certain mission. But in any way playing missions makes the pickups respawn quicker than doing nothing. Any chance to force the game to respawn the pickups by trainer? I played around with the IPLs last night and I can confirm that int01_ba_equipment_setup﻿﻿ controls the DJ setup. However, I wasn't able to get rid of the screens infront of and behind the stage. No matter, it would have been a nice to have thing if the trainer were able to sort of repair the messed up script in V that makes the other pickups vanish if you collect one. Anyway, I suppose your focus surely is on other projects. Seems they added a new radio station to GTA-O that is not found in Storymode: Los Santos Underground Radio. Any chance to enable this radio station by trainer? It plays the same music that is audible while in a nightclub, so there must be a way, or am I totally wrong on this? I have no idea just yet. Is it a normal radio station, present in the radio wheel in online ? 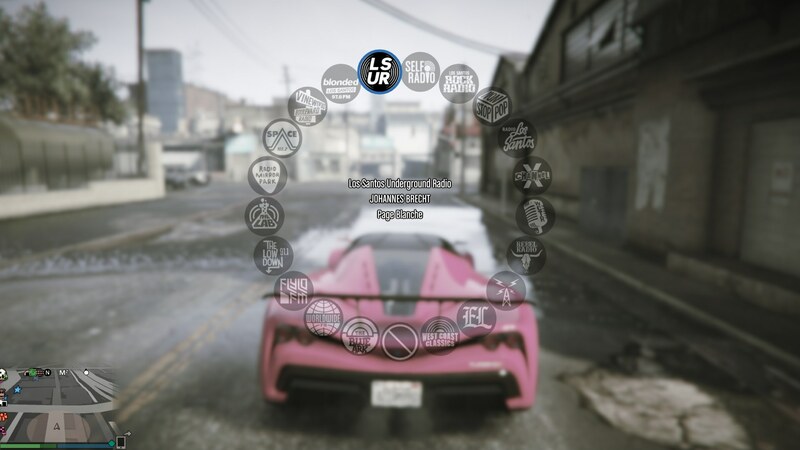 yes, that's right, there is a new radio station on the wheel with the After Hours update, but it is only seen on the Online, in the Story mode it does not appear, it reproduces all the music of the Djs. Tossers, there is nothing stopping them from adding this in SP, but we know, this company has a global to make any of the DLC cars disappear when they are spawned in SP. So no surprise. In the coach appear in the section liveries but do not apply to the car. Sorry, not sure if I understand this ? The cars I mentioned earlier, cars that are in the game for some time with this last update Rockstar added several liveries for them, in the trainer in the section liveries appear but when I select some does not apply on the car. Oh that is strange, can you give me a specific example ? -Added Privacy glass in the Nightlcub Office. -Ability to open the Nightclub Office Save. -Ability to add smoke in the nightclub dancefloor. -added 89 scenarios, which means that list is now updated and has all available scenarios. -Thanks to doppelblind the Underwater Pickups have all been named. -Added a few Walkstyles, at the end of the list. -Ability to open and close the bomb bay doors in Vehicle doors and windows menu. blonded station in the default radio function, this has now been corrected. The Los Santos Underground station is also included in the default radio function. -Ability to dim the Nightclub Office Lights. -Ability to open the Nightclub Office Safe. 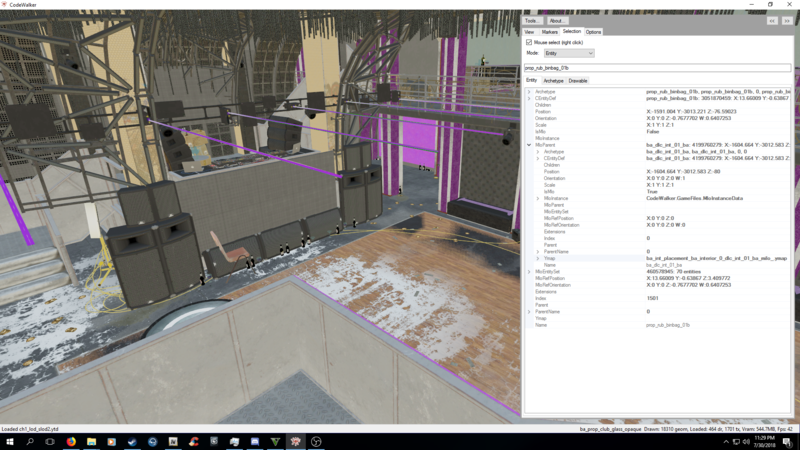 -Ability to add smoke on the Nightclub Dancefloor. -Ability to enable the Thropies in the Nightclub Office and Safe. Sjaak, I have additional underwater pickup coordinates. These are the pickups from the Alamo Sea, that become available after the storymission Minor Turbulence. I don't know if it's better to put them in a separate section, due to them not being available from the startup, but that's up to you. Just wondering, but do you plan to activate the other three playlists for LSUR? So far it just seems to loop Solomun's set.